Azura Style: Bahama Colorful beaded dual band slide sandal on a cork wrapped wedge with adjustable hook and loop top strap. Plus stop-you-in-the- street stares and compliments you will receive each and every time you're out. We say, buy one for days and the other for nights. Heel Height (approximately): 1 3/4" cork-wrapped wedge, 3/4" platform. 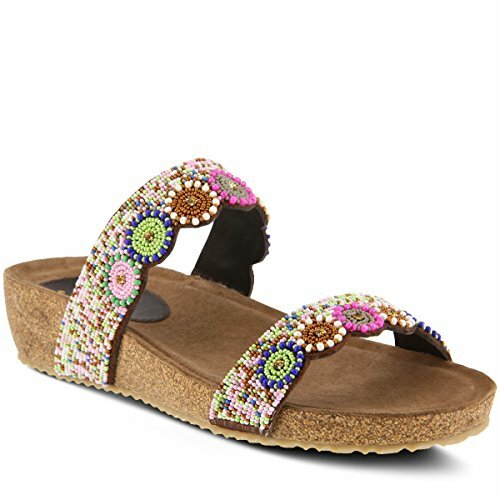 Features: -Round toe, multi-color beads and crystals adorn this dual cross band slide sandal, adjustable strap. -Adjustable hook-and-loop strap. -Tonal leather lining. -Leather padded insole. -Rubber outsole. -Made in India. Heel Height (approx. ): 1 3/4" cork-wrapped wedge, 3/4" platform. If you have any questions about this product by Azura, contact us by completing and submitting the form below. If you are looking for a specif part number, please include it with your message.